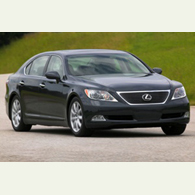 (autoinsidernews) - On Friday, Lexus announced pricing for its flagship LS 460 and LS 460 L sedans. Equipped with more features than just about any car on the road, the fourth-generation LS blends new levels of performance, sophistication, contemporary styling, and luxury refinements. The all-new LS models start at $61,000 for the LS 460, with its first ever L' model starting at $61,000. Both cars are powered by a newly developed 4.6L V8, delivering 380-hp mated to an eight-speed automatic (yes, eight-speed), which is the first for any manufacturer, reports Trend. Lexus has combined enough advanced active and passive safety technologies to help assure that you don't accidentally take the luxury cruiser off-road, including Vehicle Dynamics Integrated Management (VDIM) stability system, which integrates and manages a new Electronically Controlled Brake (ECB) system, Electronic Power Steering (EPS), Vehicle Stability Control (VSC), Anti-lock Braking System (ABS), Electronic Brake-force Distribution (EBD), and engine torque via the electronically controlled throttle. The LS is also available with a pre-collision system with dynamic radar cruise control. Just in case the technology fails, the new LS has eight standard airbags, including a twin-chamber front passenger airbag with both driver and passenger knee airbags, and a potential of ten airbags with option packages. The 2007 Lexus LS 460 and LS 460 L go on sale on October 20.